My father-in-law, Anthony P. Vander Goore, served in the Navy during W.W.II. 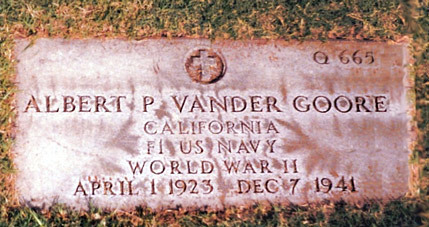 His brother, Albert Peter Vander Goore, was killed aboard the U.S.S. West Virginia at Pearl Harbor on December 7th, 1941. During those early days of W.W.II, communications were sparse and nowhere equal to today's instant web and media capabilities. Of course, there was also confusion. Anthony had related the story many times regarding his brother Albert's death aboard the U.S.S. West Virginia, and also of a strange but not unusual notification to the family regarding his death. 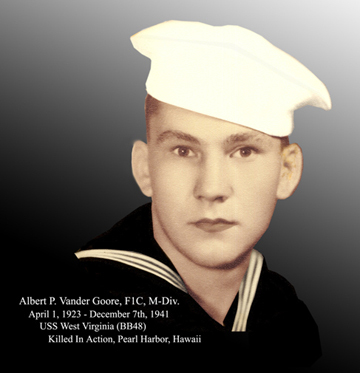 Apparently, the Vander Goore family was notified that Albert was known to have been killed aboard the U.S.S. West Virginia, which was sunk at anchor next to the U.S.S. Arizona. They were also told that his body was missing and not recovered. Years passed. In 1971, 30 years after the attack on Pearl Harbor, my wife Kathy and I were celebrating our tenth anniversary in Hawaii. Anthony asked that we go to the Punch Bowl cemetery and take a photo of Albert's name on the MIA, or body not recovered, memorial wall at that cemetery. We searched the wall but did not discover Albert's name, so we went to the grave's registration office and were told that Albert's body was recovered and that he was buried there. We located Albert's grave, placed flowers by his name, took photos for his aging brothers and sisters, and toured the inspirational site. His parents had long since passed away, never knowing Albert was buried at the Punch Bowl in Hawaii. Of interest, was a small monument at the cemetery celebrating forgiveness and friendship between soldiers and sailors of both sides. PS: If there is a PS, it is this: Anthony's grandson has been married for nine years now to a wonderful woman who is a Japanese citizen. She is in the final stages of receiving her U.S. citizenship. Anthony now was two beautiful granddaughters, ages four and 18 months. The family went to Japan to meet and visit the new relatives (they have since visited with us twice). Their clan gathered and made us all most welcomed. 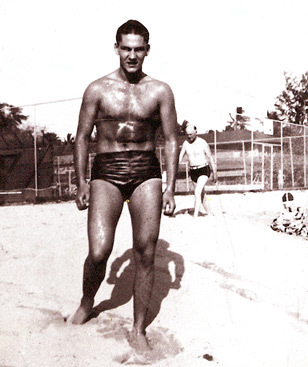 My daughter-in-law's father, like me, was not born at the time of Pearl Harbor's attack. Nevertheless, he was concerned how Anthony felt about his grandson marrying a Japanese citizen, having lost his brother at Pearl Harbor (almost all of the men of W.W.II age were killed in the war on their side of the family). Anthony made it known that he harbored no ill will against the Japanese people: Soldiers and sailors on both sides did their duty. I have some photos of Albert and Anthony, along with the West Virginia, and will scan and e-mail them asap. Albert's brothers Anthony and Jacob both served aboard the USS West Virginia.